We are one of the leading manufacturer, exporter, supplier & service provider of Pneumatic Reel Stand with Disc Brake. Our other products range includes Newspaper Printing Machine, Book Printing Machine and many more. Our company is instrumental in the manufacturing, supplying and exporting of optimum quality Pneumatic Reel Stand with Disc Brake. Soured from well known vendors, good quality metal is used in the manufacturing of these products. Highly demanded in the market, these are stringently checked by the quality controllers before their final dispatch. 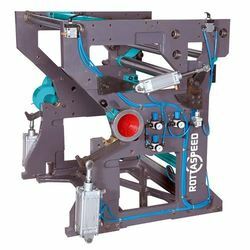 Our company is known as a specialist in offering a huge array of Reel Stand For Web Offset Printing Machine. Our Web Offset Printing Machine comes with modular construction which leads to its easy up gradation and low maintenance.